9: Meet Lt. Wood, U. S. Marine Corps! Well, your son and brother is an officer now–meet Lieutenant Wood, U. S. Marine Corps! Gosh it sounds good! And everything is wonderful so far, all the quarters etc, food–more comfortable, roomier, and more luxurious. And you have no idea how much better it makes one feel, being treated like a gentleman instead of a dog–being served, saluted, and respected. The uniforms are swell­–look good and feel wonderful. And cost like Hell. Honestly folks, you never saw so many charges, supercharges, extra bits of equipment that you have to get–and aside from my one luxury of the Sam Browne [I] have gotten the littlest amount and the cheapest–and although I don’t know yet, still I think I’m going to spend about $350 before I’m through. Well, it’ll use up most of my first month’s salary plus the allowances. I’m getting insurance, but it doesn’t start until November. Very cheap­–$6.60 a month for $10,000, about 1/3 what I’m paying–or you’re paying! And then there’s beneficiary plan. Doesn’t cost me anything, but in case I’m a casualty–that’s the nice factual sort of way they put it here–then you get six months additional pay at the pay rate I’m now getting. So all in all I think you folks will be pretty well protected and there is an amazing amount of comfort in the thought. Last night–every night–we have a compulsory study hall. And now I’ll be able to get more letters off to you all. Last night a couple of fellas–I mean Lieutenants–and myself went over to the Senior Officer’s Club–we can go to that and to the Bachelor Officer’s Club, and believe me, it is wonderful. The Union League Club has only a slight edge on it. Very comfortable, and the best Scotch and soda on the market for a quarter, [a] Tom Collins for 20¢–walnut paneled reading rooms with easy chairs. I can see that many of my leisure hours, and there will be a few more of them now, will be spent in those delightful surroundings. I went to Washington over the weekend and had a wonderful time–really cut loose for 24 hours–drank a lot, but not too much–spent more money than I should have, but that’s healthy once in a while, too. We tooted all over the town, got in at five at the Caviers[? ]–and it is a roomy place!–and slept till almost one. It felt really wonderful to relax. People in general weren’t very impressed with a Second Lt. in the Marine Corps. They see plenty of them around here, but we had a good time anyway. Ed wasn’t there–nor was Jane–and the Timmis’ house is pretty far out, so we didn’t get any dates, but we had a swell time just as it was. Things are crowded again–I knew that the comfort, ease, etc. couldn’t last more than a day or so. We are at these desks ten hours a day every day now, and after the building up period we’ve been having, you get awfully restless & pent up. But we are learning a Hell of a lot. Everything from Naval Law to map reading. 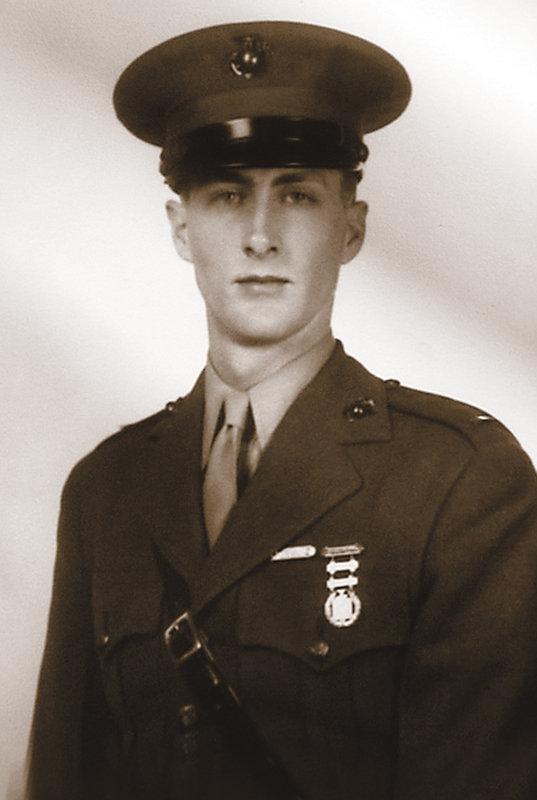 September 25, 1942 was a red-letter Friday for nearly three hundred young men at Quantico. 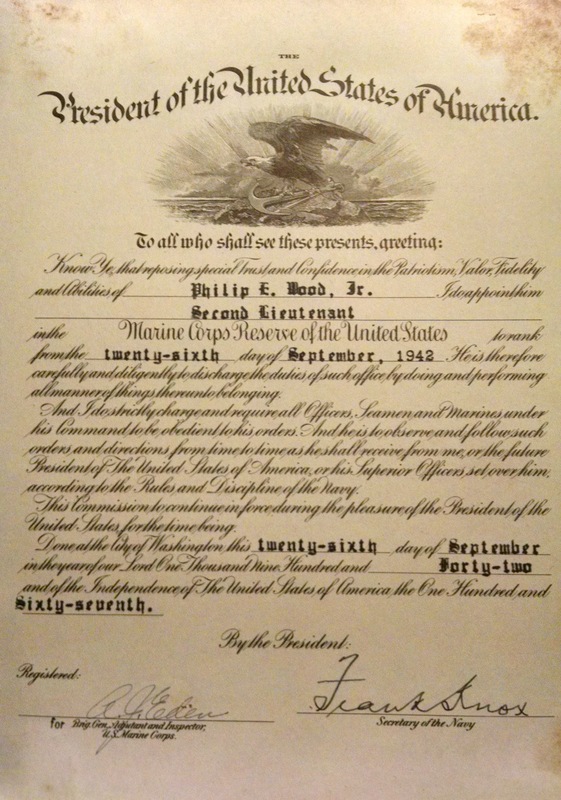 Having been examined and found duly qualified to accept the responsibilities of the service, they were formally discharged as enlisted men in order to accept their commissions, which went into effect the following morning. For once, Phil didn’t care about grades–he was among the last to graduate–he was simply happy to make it through. A low pass was still a pass; some eighty of his comrades were not recommended, although a few managed to win their commissions at the eleventh hour. 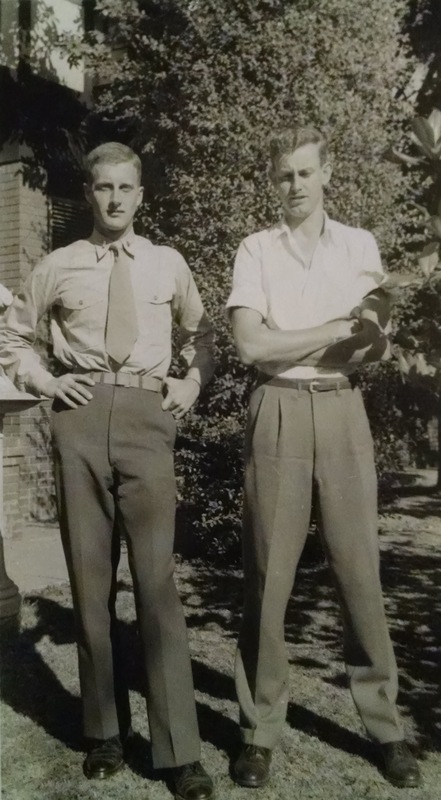 Second Lieutenant Wood in his tailor-made uniform–with his “one luxury” Sam Browne belt crossing his chest. Rank has its privileges, and the new “Second Looeys” were quick to take advantage of their new status as officers and gentlemen. Resplendent in their tailored uniforms, their new gold bars polished to a high shine, they took to the nation’s capital for a weekend of relief–a throwback to their college days, and many (like Phil) took the chance to look up friends who had gone into other branches of the service. Phil Wood with an unidentified civilian friend, shortly after receiving his commission. Then came Monday, and a return to barracks life–with the occasional beverage at the newly-accessible Officer’s Club. Scenes at Quantico. USMC Photos. 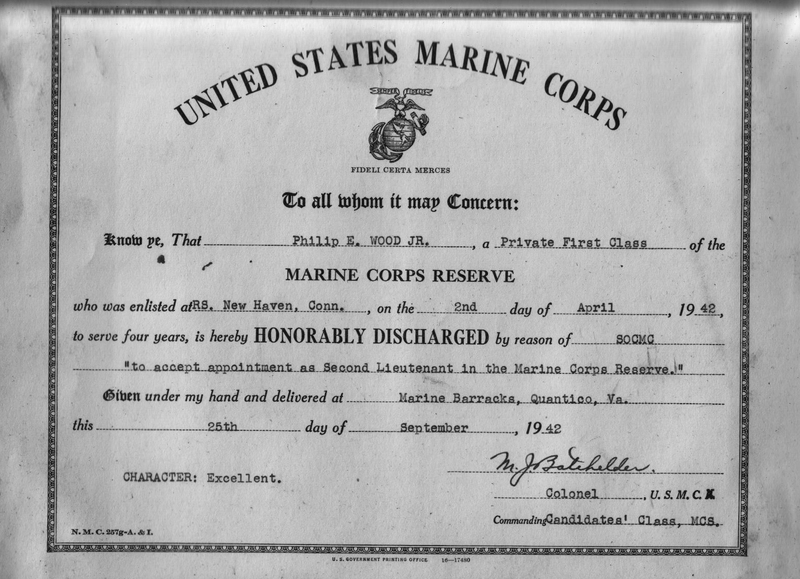 Phil received his commission on 26 September, 1942 and was assigned to Company F, 12th Reserve Officers’ Class at Quantico the same date. The new officers were granted a weekend liberty before starting classes the following Monday. As officers were required to purchase their own uniforms, many went the extra mile (and expense) to have them custom fitted by professional tailors. Named for its inventor, General Sir Samuel James Browne VC, the Sam Browne belt features a cross-chest strap originally intended to support the weight of a sword. A popular accouterment in armies around the world, it was adopted as part of the Marine officer’s dress uniform in 1920. A private gentleman’s club in Murray Hill, Manhattan. Unclear who (or where) “the Caviers” were. Ed and Jane are presumably friends from Swarthmore, as was William “Bill” Timmis, one of Phil’s fraternity brothers.